Wow! 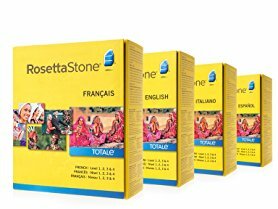 Right now you can get the Rosetta Stone Levels 1-4 - (Your Choice: Language) for only $129.00 (Reg. $449.99)! Rosetta Stone’s educational blend of reading, listening, speaking, and writing for new speakers garnered a PC Magazine Editors’ Choice award for Best Language-Learning Software. The interactive lessons rely on speech-recognition technology to give instant feedback on pronunciation, making it simple to succeed at conversational skills ranging from telling time and discussing weather to sharing opinions and challenging Napoleon to a rap battle. Rosetta Stone’s supportive community of online learners engages pupils in live conversations, game play, and live practice sessions with native speakers. The included audio companion allows for language practice on the go.